Storage. Water. Air. Tools. SWAT. Specialized’s SWAT technology is providing convenience, ease, and comfort to riders. Consider their Mountain Bib Liner with SWAT. For various reasons, many mountain bikers shy away from the Lycra – even pro XC racers like Marco Fontana and Manuel Fumic. However, avoiding the Lycra also avoids the benefits of wearing a kit like a roadie – the pockets, which are most often found on the lower back of the classic cycling jersey. More often in mountain biking that road, Camelbak Hydration Packs are used to carry tools, calories, and hydration. 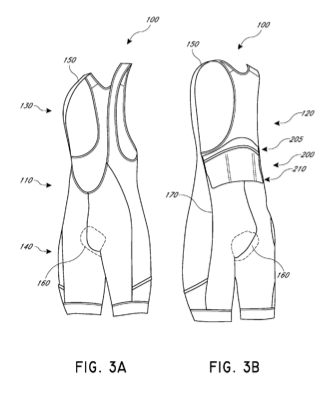 And, Specialized is pursuing patent protection for those pockets. US Patent Application 13/802,245, filed March 13, 2013, is currently pending but has not yet been acted upon by the USPTO. [T]he pocket 200 comprises a secured portion 205 and a hanging portion 210. … the secured portion 205 is located above the natural position for a waistband 310 of a pair of loose fitting shorts 300. … FIGS. 2A-2B illustrate a pair of loose fitting shorts 300 worn with the waistband 310 at a natural position on a user. The hanging portion 210 of the pocket 200 allows some of the pocket 200 to overhang the waistband 310 of the loose fitting shorts 300 since there is no connection between the hanging portion 210 of the pocket 200 and the athletic garment 100. As illustrated in FIGS. 2A-2B, the waist band 310 of the loose fitting shorts 300 at its natural location occupies the space between the athletic garment 100 and the hanging portion 210 of the pocket 200. 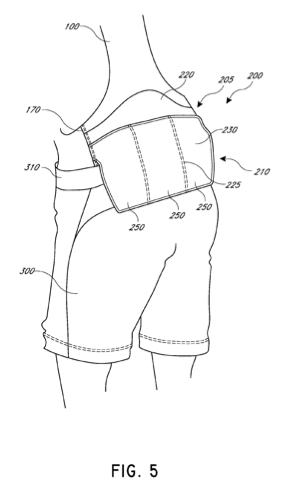 The hanging portion 210 allows the loose fitting shorts 300 and the pocket 200 to occupy the same area near the user’s lower back, allowing the loose fitting shorts 300 to sit at their natural position and not be forced downwards by a loaded pocket 200 while the pocket 200 is located in an ideal location for the user to access the contents of the pocket 200. FIGS. 2A, 2B, and 5 (below) show the hanging portion 210 of the pocket 200 hanging over the waistband 310 of the loose fitting shorts 300. In other words, pockets on your lower back (like a traditional cycling jersey) that hang over the waistband of your baggies. Assignee: Specialized Bicycle Components, Inc. In honor of the Cyclocross World Championship (congrats to MvdP – great race! 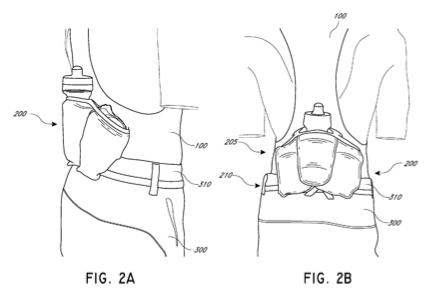 ), here’s a patent that issued to Specialized in May 2014. The Specialized Crux is beautiful ride and demonstrates Specialized’s dedication to cyclocross. 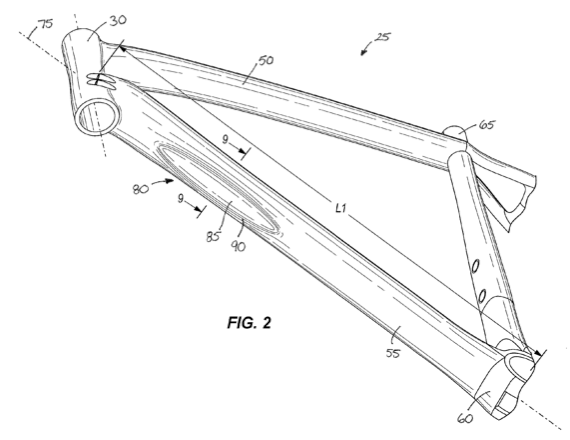 Referred to as the “Love Handle,” Specialized provided a grip (“concave section”) on the bottom side of down tube of the Crux frame so that the down tube is easier to grab when shouldering the bike. The “Love Handle” has been well-received. [T]he down tube 55 includes a concave section 80 that is disposed on an underside (i.e., facing generally downward toward the ground) of the down tube 55 to accommodate a hand of a bicycle rider. Alternatively, or in addition, the top tube 50 can include a concave section (not shown) that is similar to the concave section 80. Note that the disclosure provides for another grip on the top tube, although it’s not shown in the drawings. And, we appreciate Specialized’s playfulness in marketing this feature as the “Love Handle” – it’s great to see a large company show some personality.